Considering all the warm weather we’ve been having, I made time one Saturday in March to go fishing at the Gunpowder Falls River in Maryland. It’s only about an hour and twenty minute drive from the district, so it’s not too far for me. This was the first time I’ve been able to spend a few hours here, and it’s a fun spot to fish. There are what I’d consider two separate stretches of water on this river. The first section I visited has the flow and structure of a mountain stream above Falls Road, and then there’s a quieter, more meandering section south of Masemore Road. In between Masemore and Falls Road there is a primarily slower section or river which seems perfect for dry fly fishing. In fact, just below Falls Road I saw a few small brown trout cruising at the surface looking for bugs. I decided to start above Falls Road and quickly caught a feisty Rainbow just above the bridge in shallow riffles. It took a shiny little nymph with a purple head that I have used with success on rivers that are new to me. I’ll post a photo of that fly later this week in case anyone’s interested. 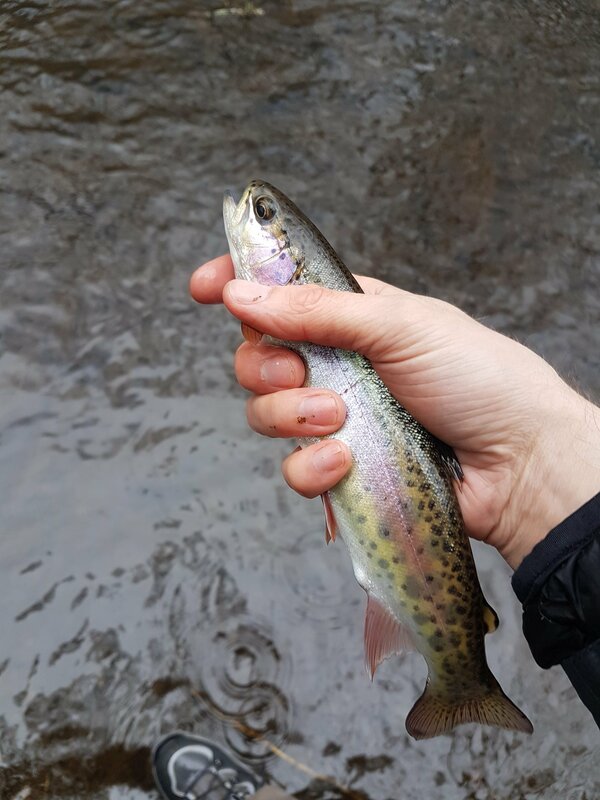 I ran into other anglers shortly after, and they mentioned that the rainbows were more common in the upper stretches close to the dam. 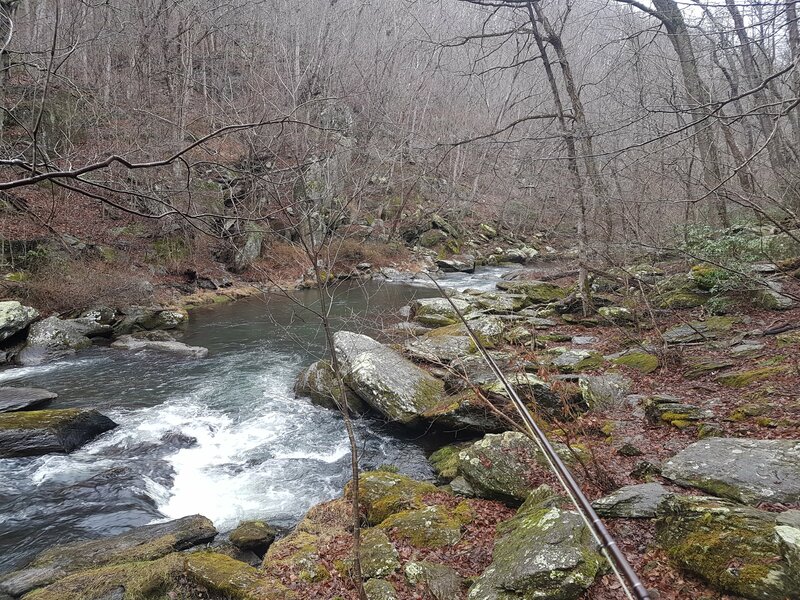 According to those anglers, this stream holds wild rainbows, browns, and brook trout. I continued upwards and started fishing a few of the deep plunging pools along the way. I hooked into what seemed like a good sized fish, which quickly took my fly under a submerged branch to free itself. There seems to be many underwater structures in this section, so it’s best to keep the pressure on the fish here if you can. The Gunpowder River above Falls Road. Very beautiful. After a few hours of hiking and fishing, I decided to call it a day. It had started to rain more heavily and I was slipping around a lot on the rocks. If you’re fishing the upper section above Falls Road, I’d highly recommend having studs on your boots. They have saved me from taking a swim more times than I can count! It’s amazing to have a population of wild trout such a short drive from DC and Baltimore, and I’ll be glad to learn it more. Hope to be back on a less rainy day to give it another shot. I am glad you are finding fly fishing opportunities in the Maryland area. Unless I miss my guess, you will be heading north to the limestone streams of Pennsylvania soon as well. Thanks, Sam. You’re right about that, as I do have plans to fish the limestone streams in PA soon. I made it to another local stream in Maryland this past weekend, and had a fun day of catching trout on dries in some very shallow water. Most of the fish were holding in about a foot of water by a bank. Had some explosive rises and some frustrating hang ups on the brush by the bank. Hope you’ve been able to get some fishing in this spring, I hear it’s been fairly snowy in MA.